Along with women and wind, stone is one of Jeju’s three plenties. If women made the island, and the wind sculpted it, rock was the raw material. From its genesis, rock has defined Jeju to its core. Some 2 million years ago, seabed volcanic activity gave birth to a shield volcano, rooted deep into Yellow Sea continental shelf and eventually rising to 1,950 meters. The phreatic eruption, an explosion of steam, water, ash, rock, and volcanic bombs burst forth and further hydrovolcanic activity seared through Pleistocene seas. Volcaniclastic sedimentation eventually led to Jeju taking shape, and each time one of the 368 monogenetic volcanic cones, or oreum, were active — some say as recently as 1,000 years ago — lava effusions would wend across virgin land. The earth’s regurgitation of molten rock turned Jeju into an island of crusts, caves and crevices. This volcanic heritage was rich inspiration for mythology and folklore, but the volcanic soils were poor for much else being rocky, thin and exposed to high winds. With the highly permeable, rocky and black soil covering most of the island, rice paddies were out of the question. Only 23 percent of all Jeju soil is actually non-volcanic, with this being restricted to the northern and western coasts. 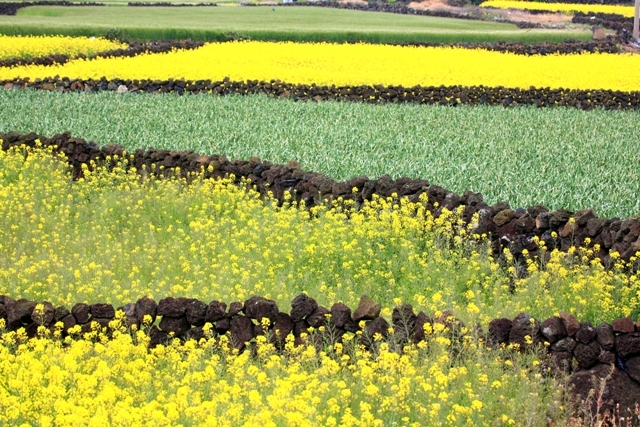 Jeju’s arable land is accordingly mostly jakjiwat (soils with up to 40 percent loose rock), or billewat (land with shallow or exposed bedrock), Jeju people had to find indigenous ways to increase yields. Rather than seeing it as a problem, Jeju people used the rock to their advantage. 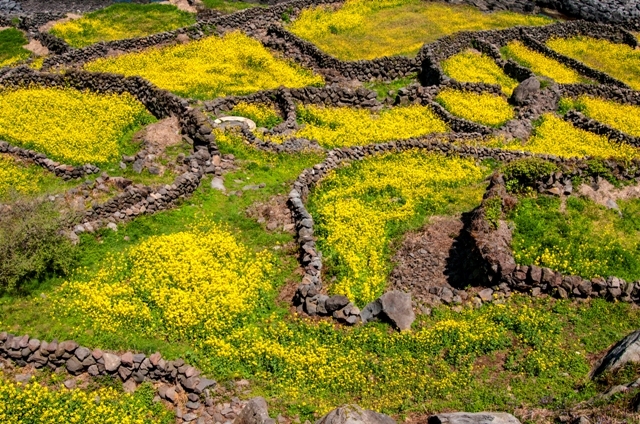 Faced with erosive high winds and leaky soils, farmers around 1 CE began making “batdam,” drystone walls, from the volcanic detritus in fields. Millennia on and these walls still chop up Jeju’s chocolate-colored fields, the accumulated black rocks preventing soil erosion, maintaining soil richness and increasing water retention. They also demarcate fields and ensure cattle and horses don’t damage crops. Of course, many cultures have agricultural drystone walls from the British Isles and Zimbabwe to Peru. The Jeju difference is the lack of earthen foundations and adaptation to the wind. Their air holes allow Jeju's hearty gusts to burst through, increasing the chances of them staying erect year-round. In recognition of this worth, the UN’s Food and Agriculture Organization (FAO) inscribed Jeju’s 22,000km — enough to go halfway around the earth — of batdam as one of our Globally Important Agricultural Heritage Systems (GIAHS) on April 4, 2014. 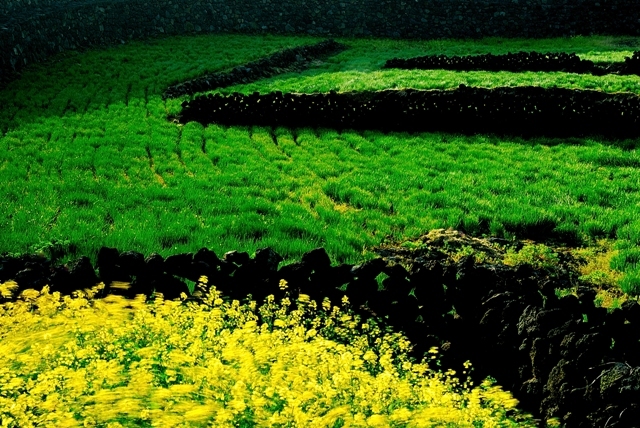 In being designated, Jeju’s drystone walls are ranked alongside the Aohan Dryland Farming System in China, the Saffron Heritage of Kashmir, India, and Traditional Reindeer Herding in Siberian Russia. It is hoped that the designation will bolster preservation efforts and funds for further research and education measures, in addition to a comprehensive conservation management plan to ensure Jeju’s stone walls are utilized as a valuable cultural asset. Reflecting the volcanic heritage of the area, the batdam are best seen in Jeju’s northeast in the hinterland of Gimnyeong and Woljeong. Here visitors can even find the Billewat-gil and Durubille-gil walking paths celebrating Jeju’s lava heritage, the latter part of the Geo Trail network. There are threats ahead, however, and every year more and more batdam is lost to the bulldozers. Although the GIAHS inscription is an explicit recognition of their cultural and historic worth, development is chipping away at the walls rock by rock. Regardless of the remaining 22,000km, every stone is a piece of Jeju heritage to bequeath to the next generation. Concrete could well replace the walls before we see concrete conservation measures from the provincial government, so while there is still time get out and walk among the batdam, exemplars of traditional wisdom and sustainable agricultural practices.